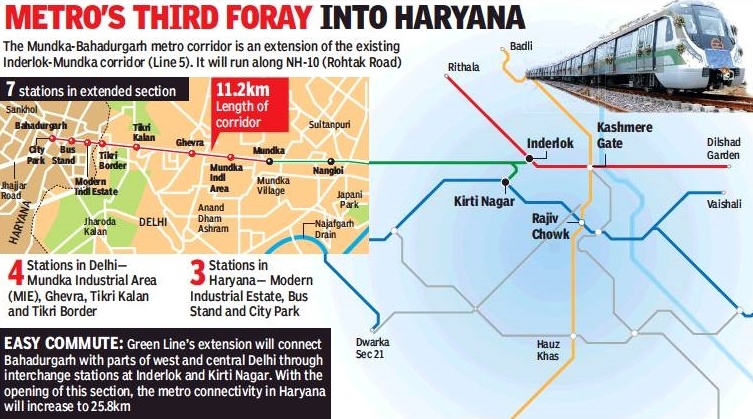 With the opening of the 11.2 km Mundka-Bahadurgarh stretch of Green Line, Delhi Metro will make its third foray into Haryana — connecting Bahadurgarh to the heart of Delhi. Operations on the corridor will start from 4 pm, with the inauguration likely to be carried out by Prime Minister Narendra Modi via teleconferencing in the morning. In addition, Union urban affairs minister Hardeep Singh Puri and Haryana chief minister Manohar Lal Khattar is expected to attend the inauguration ceremony in Haryana. Every alternate train from Mundka will travel to City Park in Bahadurgarh and a frequency of around eight minutes will be maintained between Mundka and City Park. The total running time between Inderlok/Kirti Nagar and City Park (Bahadurgarh) will be around 50 minutes. The Mundka-Bahadurgarh stretch is an extension of Delhi Metro’s Green Line from Inderlok to Mundka and will add an additional seven stations to the Green Line — all on the elevated corridor. While four of the new stations lie in Delhi (Mundka Industrial Area, Ghevra, Tikri Kalan and Tikri Border), three stations fall under Haryana’s jurisdiction (Modern Industrial Estate, Bus Stand and City Park). With the opening of this section, the entire Inderlok-Bahadurgarh section would become 29.64 km-long. Haryana already has over 21km of metro line under the DMRC network, with both Faridabad and Gurgaon covered under it. With the opening of this section, Delhi Metro’s growth in Haryana will expand to 25.8 km.